Over at Cirsova, a food and fantasy blog carnival runs until the 21st. Food can evoke emotion and conjure sense memory. Responses to those emotions and sense memories are typically visceral. Dietary habits for people are primarily beholden to environment and agriculture. Culture and religion may shape this further. There are other factors involved of course. Exploration, conquest and trade may introduce new food. The popularity of garum (a pungent sauce made of rotted saltfish) among the Greeks, Romans and the Byzantines enabled trade across the Mediterranean and as far as Roman Britain. The New World brought potatoes and tomatoes to Europe. Chocolate (chocolatl) was another export that found favour with the Spanish. Wars have been fought over salt and pepper inspired epic exploration. Immigrant populations may bring their own foods and spices. The popularity of curry in Britain, or variations in Minnesota lutefisk follows immigrant influence; if your game has an invading population or a neighbouring culture, their food and drink influences yours. Elven baklava may be served with coffee and a pipeweed hookah in a free port tavern where halflings and elves have neighbourhoods in a Moorish-based settlement. Wealth and status brings a better class of food - usually. Access to certain ingredients (salt) and spices may require wealth. Peasant staples are transformed by quality of ingredients. Breads may have finer flour or more wheat. Now add to this other dishes. Laws mark foods (rabbit or venison) as noble perogatives. Roasted meat means fresh good-quality meat, more likely noble fare. Some noble delicacies however, are less than desirable. In some settings, there is sufficient civilisation to ensure fine fare. 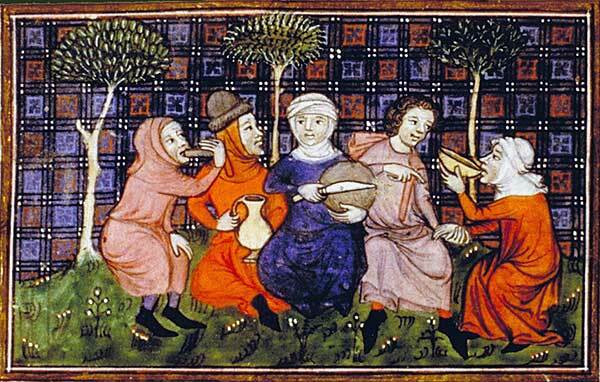 Courtly food may be about theatrics as much as taste. Serving swan to royalty is mostly ostentation. A high-fantasy equivalent may serve dressed cockatrice to nobles. Magical augmentation of the meal is another option. These combinations create meals worthy of fairytale. A truly imaginative chef may have opportunities for extraplanar travel. Other locations may have limited opportunities for the gourmet adventurer. The dungeon expands culinary horizons out of necessity. Roasted cave fish, select mushrooms and dwarven spirit may keep you happy (and off iron rations) for a little while until the wood runs out. In the deeper underworld, your host might serve chilled goblin brains served in a trephinated skull. Similar perils face those in desolate wilderness. Arctic glaciers and burning deserts are not plentiful larders and eating sentients is an occupational hazard. The discovery of exotic foods and drinks made fortunes. Enterprising adventurers may find themselves in wars over spices. If they inspired Marco Polo and Vasco de Gama to cross half the world, your lot might go some distance. Royal charters, trading company monopolies, dragons with alternative hoards - all can provide unique adventures for characters. Good thoughts. This is probably an overlooked aspect of fantasy worlds in rpgs to be sure. You know, there oughta be.